I’ve been surprised by how different making your own TV show is to helping someone else make theirs. Whenever I’ve produced TV shows in the past, I’ve always been the second in charge, helping someone else realise their vision. Earlier this year I found out I’d successfully applied for a grant from the Community Broadcasting Foundation and was going to get a chance to make my own show. 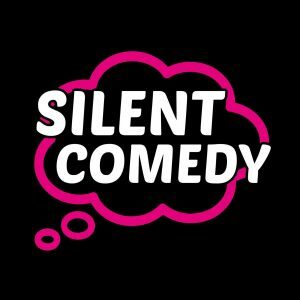 The show is called Silent Comedy. It’s a 1 hour special for Channel 31 featuring 8 of Australia’s best established & up and coming silent comedians – comedians who don’t use any spoken word in their act. As someone who grew up watching Mr. Bean, I’ve always had a huge love of physical, silent comedy. Over the years I’ve worked on a number of comedy shows where the producer would say ‘no slapstick’ when briefing the writers, and it always made me sad. If I may Eat Pray Love this for a moment, it feels like I’ve discovered a super power of late – if you don’t like something about the way things are being done, you can go out and create the world you want to live in. One of my main missions at the moment is to start creating paid jobs for comedy writers in Australia, especially in the area of one-liners. Until a couple of months ago when I was lucky enough to get to help create a new comedy show for Channel 9, all of my comedy writing work, the majority of which is writing topical one-liners, has come from overseas. I think the Australian industry is missing a step that used to exist when we had more late night and sketch shows on TV. How can we expect writers to come up with a funny 30min sitcom if they can’t write a decent one-liner? My other mission is to keep making multicamera comedy shows in front of studio audiences. That live audience element just makes everything feel so much more alive. For the cast and the crew. On Silent Comedy, we sold out all 80 studio audience seats a week before the shoot. The demand is there! RMIT University Studios, where we shot the show, is a phenomenal facility. It was a privilege to play in it. They told us Silent Comedy was the biggest production ever mounted in the studio. The new ground we were breaking meant there were bumps along the way, but we had an incredible team of about 50 people who brought it all together. I’ve discovered that I really enjoy the challenge of trying to hire good people. If you ever want an organised production, I’d highly recommend hiring Mary Verikios and Joseph Betros. They were my production coordinator and production manager respectively. I loved working with them. The other person that requires singling out is director Nicholas Bufalo. A week before rehearsal I had to find a new director. The seas parted and Nick appeared. He has that rare combination of being able to bulldoze through any problem, while also being a really nice person. I guess that’s why he’s had the career he has had. The cast of Silent Comedy were wonderful to work with. Without exception, all of them are total professionals and you should hire them to be in your shows. The cast is: Hayden Burke, Rob Caruana, Patrick Collins, Jack Dan, Rod Lara, Dana McMillan & Charlotte Salusinszky, Joana Simmons and Andi Snelling. Ross Purdy also features heavily as a certain piece of fruit. I learned a tremendous amount on Silent Comedy. I feel very lucky to have had a chance to make my own show for Channel 31 before I hopefully get to do it in the big leagues. The premiere date is still being confirmed, but it’s likely to be the second half of November. We’re currently in the edit and I’m pretty excited to share it with audiences. 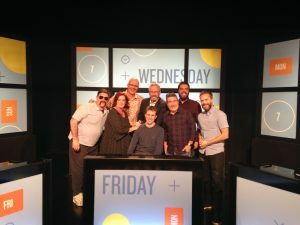 In other news, the New Zealand comedy game show I write for, 7 Days, had its 300th episode last night. I’ve worked on 122 of those. Every week when I watch the show back, it still makes me laugh more than any other show on TV anywhere. I have a feeling that the rest of my career will be spent trying to find a job that has given me as much joy as writing for 7 Days has. And finally, on Monday I’ll be back in the same studio we shot Silent Comedy in to shoot a brand new live half talk show called Emmylou Loves. We’re making 5 episodes. It premieres on Monday 29th October, 8.30pm on Channel 31, Facebook Live and YouTube Live. Back in 2014/2015 I worked on an Australian sitcom called Fix Her Up. I wrote an episode and was the script editor on the series. Much of the writing I did on the show was completed while in Los Angeles, so it’s only fitting that 4 years later, the show is now finally available in the U.S. Thanks entirely to the tireless work of creator and showrunner Arden Pryor, Fix Her Up is now streaming on Amazon Prime in the U.S. and Canada. The show was entirely self-funded and originally premiered on Channel 31. It just goes to show how important community television is to the Australian TV industry. Of course, I picked the week the All Blacks were playing France at Eden Park. First week of being a proper TV writer and first All Blacks game sounded like a good one-two to me. TV3, the company that makes 7 Days, owns this this old, old house in Eden Terrace, which houses the writers rooms. They were exactly how you want writers rooms to be – at the top of a creaky staircase, with paint peeling off the walls and two toilets, one of which is “not as good as the other”. For about five hours I sat in a room with head writer Ben Hurley and arguably New Zealand’s top stand up comedian, Brendhan Lovegrove and we simply came up with jokes for the show. Ben wrote down the good ones on his laptop. 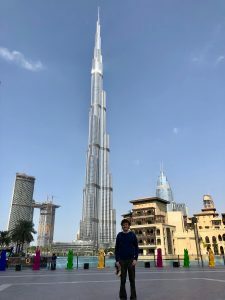 All the years of doing exactly the same thing working on Channel 31 shows in Melbourne meant I felt very comfortable in what could have been a terrifying situation. Across the hallway from us, another team of three writers also came up with jokes for the show. One thing that stood out across the entire production of the show is the amount of prep work that goes in, especially as far as the writing and cast prep is concerned. I think Australian comedy game/panel shows could learn a lot from the way 7 Days is run. It’s never an accident when a show stays on air for 10 seasons. The next day, the person who hired me three years ago, Rob Brown, took me out to lunch. At the time he was the associate producer, now he’s the producer and showrunner. Also lunching with us was the current associate producer Thom Watts, who amongst other things is an accomplished musician whose band has supported the likes of ACDC. Rob and Thom couldn’t have been nicer in answering all my questions about how the show works and were tremendously generous with their time. Writers are not used to being treated like this. The taping of the show later that evening was an experience I’ll never forget. I’ve always found attending the tapings of TV comedy shows to be very emotional, since writing for them is all I’ve ever wanted to do (since I stopped trying to become a golfer). So to be in the audience of a show I actually write for was completely overwhelming. I met the cast, the crew, all of who were delightful. It was surreal to meet the people whose comic voices you’ve had inside your head for 3 years. Whatever happens from here, I’ll always remember my first time on the set of a show I work on. Looking forward to paying it back one day when I get to produce a show like this of my own. You may think this is just another end of the year, self-congratulatory post, but you would be correct. I’m fairly certain this has been my most successful year to date as a comedy writer and producer and if you think I think it makes for an interesting read, you would be correct again. The backbone of my year has consisted of writing jokes for New Zealand’s two highest rating TV comedy shows, comedy game show 7 Days and late night talk show Jono and Ben. I only wrote for the last three episodes of the year on the latter, but I’ve been a big fan of the show since I first came across it, so I was very excited to contribute. This year we made 36 episodes of 7 Days and it was the third year I’ve written for the show. Even though the stress occasionally aggravates my psoriasis and my relationship, I love being in the weekly grind of writing for a topical comedy show. For the second year in a row on 7 Days, I won the Top Overall Spec Writer award for getting the most number of jokes on air out of the show’s 34 writers. (The producers count the number of jokes we get on and we are paid accordingly). Sometimes it’s hard living in Melbourne and writing for a New Zealand show, because I would love to meet some of the other phenomenal writers on these shows. I’m especially grateful to people like Josh Samuels and Sam Smith, who helped get me the job on 7 Days in the first place, as well as Ed Caruthers, who was so generous with his advice when I was a baby writer on the show. It sounds as though you’re doing things right. Working for two high-rated comedy shows is a good beginning for any career. It’s also encouraging to hear that you enjoy the work so much. That can be a big part of it, although there will come those times when you’ll have to make an effort to be funny when things may not go so pleasantly. It’s all part of being a professional writer. Be proud of being a one-line writer. People love to laugh and they relish the people who make them laugh. Enjoy it. It meant a lot that he took the time to reply and further helped liberate me from the counterproductive feelings of inferiority I sometimes get when I hear about comedy writers who are working in longer forms of the genre. One thing I ticked off the bucket list this year was producing a festival show, two in fact – one at the Melbourne Comedy Festival and another at Melbourne Fringe. They were both sketch comedy shows. Having achieved what I set out to achieve, after Fringe I decided to part ways with the sketch group. A month after the fact, I found out that a funding proposal I had helped compose in order to secure some funding to make some sketches for the group’s YouTube channel had been successful. So the first time I’m successful as a producer at securing a decent sized grant from a funding body and I don’t even get to make the thing!!! Never-the-less, I’m excited to see what they make. Some other fun comedy-related things I did this year included writing jokes for some stand up comedians’ acts for the first time, writing one-liners for a professional MC who runs one of the most successful sports night fundraising companies in the world, and starting a national one-liner comedy writing competition for high school students in New Zealand. Viewing-wise, the shows I enjoyed watching the most this year were Mad As Hell, This Is Us, Better Call Saul and the ABC Fresh Blood entry The Angus Project. I also thought Tonightly with Tom Ballard showed promise, so I’ll be watching that will a keen eye when it returns on Jan 8. In 2018, I’d love to keep writing jokes for NZ TV shows, as well as some closer to home. Producing-wise, I’ll have room for one or two more projects this year. Whatever those projects end up becoming, you can rest assured a live audience will feature in one if not both of them. There’s nothing like a live audience to bring out the best in everyone when you’re making a comedy. Here’s a picture of me from earlier this month, with a scale replica of Steve Smith’s batting average. I love writing and producing comedy for an audience whose laughs I will actually get to hear. Earlier this year I produced my first live sketch show at the Melbourne Comedy Festival (MICF). Now, my sketch comedy group Dr. 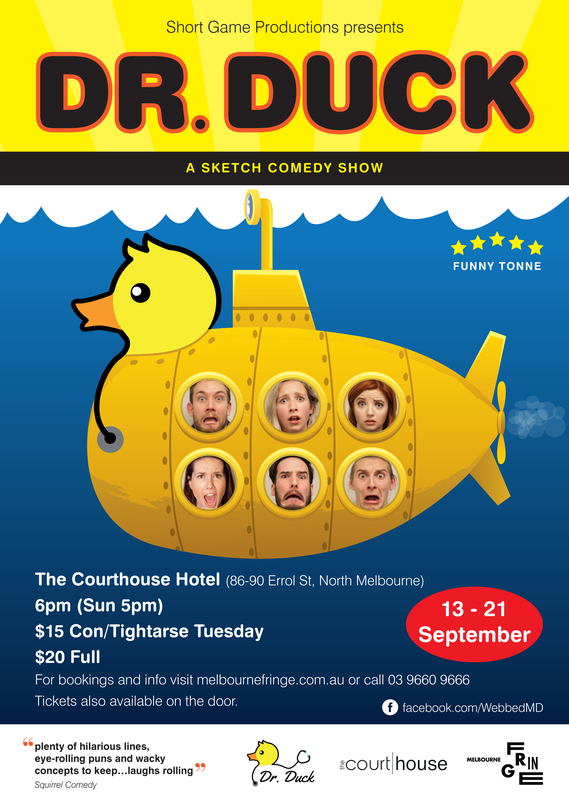 Duck have put together a brand new 50min sketch show, which will premiere at Melbourne Fringe Festival. Click HERE to see the official poster. Dr. Duck founder and my producing partner in crime, Andrew Keen, helped me put together a crack team of writers this time around. The writers met up once a week for 11 weeks, with everyone in the room making terrific contributions. Every cast member from our MICF show had either secured paid work or already booked other projects before we could get to them. We have a brand new cast for Fringe, (Andrew aside) but having sat through some rehearsals, I think the people who come and see our show have a lot to look forward to. Once actors as talented as the ones we’re working with become involved, it’s amazing how quickly I’m able to forget the back-breaking, often soul crushing work of writing comedy. I like to indulge in the thought that 50mins of funny material turned up with little effort. It’s the only way I’m able to fool myself into wanting to go through it all again for the next show we do. The laughs of a live audience also help with this. Presented by Short Game Productions. Starring Andrew Keen, Susie Kazda, Liam Howarth, Chloe Towan, Rian Howlett and Lara McArthur-Dowty. Written by Andrew Keen, Dean Watson, Lily O’Farrell, Ross Purdy, Justin P Bechtold. Additional Material by Sal Hicks, Dan Beacom. There is very little financial support for up and coming comedy writers, let alone comedy writers who are still in high school. Trying to get paid for your work is the hardest thing to achieve for any comedy writer, especially when you’re starting out. In school, class clowns get a bad wrap. I know this from personal experience. But the encouragement of a few people that it was okay to embrace this side of myself made the world of difference. 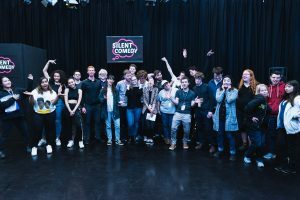 For a couple of months now, I’ve been running a comedy writing competition for New Zealand high school students, in conjunction with LearnCOACH. It’s called the NCEA Comedy Writing Competition. We pay $50 every week to the student who can write the funniest one-liner about high school in under 140 characters. Students submit their entries here. I want to show New Zealand high school students that not only can you be funny while you’re still in school, you can get paid to do it. Even the smallest payment for your work makes a huge difference to your confidence when you’re starting out. The response has been pretty remarkable and this article covers it fairly well. And since I was asked, nobody has sent me any mail disputing that. However, I’m grateful I overcame those initial feelings of self-doubt, because I ended up having a lot of fun talking to RMIT’s latest crop of screenwriting students, alongside the other two comedy people on the panel, David M. Green and Stephen Hall. You know I’m not making this up, because that’s the official poster. When I was an RMIT screenwriting student (2011-2012), I remember organising one of these panels – we had Sammy J, Kitty Flanagan and Adam Zwar along. As for our panel, it was great to have an opportunity to meet Stephen Hall. You may know him from Shaun Micallef’s “Mad As Hell” on the ABC, or as Basil Fawlty in the stage production of “Fawlty Towers“. David M. Green is also a writer for “Mad As Hell” (not to mention, a great friend). It was very exciting to be on a panel with two of the country’s best comedy writers. Thanks to Kirsty for asking me along and to John Reeves, heart and soul of the RMIT screenwriting program. There’s nothing like the presence of a live audience to bring out the best in comic actors, comedy writers and comedy producers. Everything I’m trying to do as a comedy writer and producer is channelled towards making more things before a live audience. I believe you get a better show when you come face to face with the audience. Nowhere to hide. A sense of danger elevates comedy and what could be more dangerous than coming face to face with the people who can make you or break you? Despite almost all of my TV experience coming in the form of shows that had a live audience aspect, I’ve never produced a show at the Melbourne International Comedy Festival (MICF). This year, I’m producing and writing for a 50min sketch comedy show with my sketch comedy group Dr. Duck called “General Quacktitioner“. Melbourne writer and actor Andrew Keen started the group. 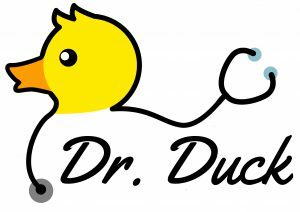 I saw Dr. Duck’s first Fringe show last year, which I thought had a lot of potential. Couple this with the fact I’ve always wanted to be involved in a live sketch comedy show, I was only too eager to take up the offer to write and produce one when Andrew suggested we team up. Andrew is a terrific sketch writer. I first worked with him when I was head writer of the Channel 31 show Live On Bowen. He and I, as we’ve discovered, have vastly different styles. His work tends to be very dialogue heavy, while my sketches tend to be almost completely devoid of dialogue and very physical. I think we balance each other out quite nicely and the show should be stronger because of it. For three months, a team of writers met up once a week to write General Quacktitioner. 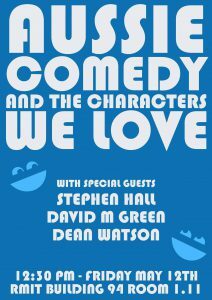 Along with Andrew and myself, the other person who wrote some sketches that made it into the show is Melbourne comedian Ross Purdy. 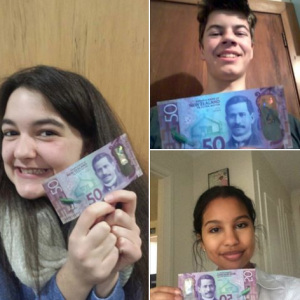 Additional material was also contributed by Nick Mateuszczyk, Ella Gleeson and Amanda Goode. We’ve got a simply cracking cast: Seon Williams, Olivia Solomons, Eidann Glover, Jon Walpole, Ross Purdy and Andrew Keen. Rehearsals have already started and things are coming together nicely. It’s always a good sign when a lot of good material ends up not making it into the show. Following our MICF show, we plan to make a 6x30min sketch comedy TV series with Channel 31. Half of it will be shot before a live audience half shot on location. There’s nothing like putting comedy before a live audience. I expect applications for writing positions on the show will go out during the week of the 27th March. This time we will be trying something different to how we approached assembling the writers team for our MICF show and will be putting out an open call to people who are interested. Keep an eye out for those callouts on this site! In the meantime, come and see our MICF show! We’ve shot some free sample sketches we’ll be releasing in the lead up to the show. The first one is called Doorknockers and it’s up now! One thing I discovered I really enjoyed doing in 2016 was writing funny greeting cards. Turns out there’s quite a market for it too…in the UK. I wrote about my experiences breaking into the UK greeting card market as a writer in the January edition of Greetings Today. Yes, they’re a magazine all about greeting cards. 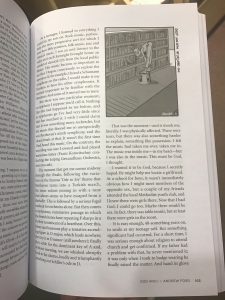 My article is on Pg 60. Apparently the inability to draw is not a factor in becoming a published cartoonist. I’ve always loved cartoons ever since I was old enough to understand what the heck was going on in them. As a comedy writer with a deep love for visual gags, I thought it might be fun to try collaborating with some artists in Australia and New Zealand. After all, as many have told me, coming up with the idea is the hardest part. As far as I’m concerned, drawing the thing is the hardest part. The scene was set for what have turned out to be two great collaborations so far. 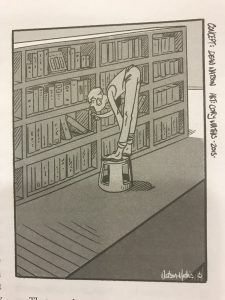 The first person I collaborated with, and the person who drew this now published cartoon, which appears in the summer edition of Meanjin Magazine, is a great New Zealand cartoonist by the name of Cory Mathis. Since I moved back to Melbourne at the start of 2016, I’ve also started creating cartoons with Belgium-based Melbourne illustrator, Jack Chadwick. Hopefully we can get some stuff published in the new year. Both of these guys are incredible artists and I feel very lucky to be working with them. Dean Watson was born in Mitcham, Victoria, the same year Margaret Thatcher resigned as Prime Minister of the United Kingdom.